I first met Brian M. Kane at the always enjoyable Mid-Ohio-Con a few years back, just after attending a panel on his award-winning book detailing Hal Foster's life and work (Hal Foster: Prince of Illustrators). Mightily impressed with the presentation and the book itself, I made sure that I'd have a chance to talk with the man behind it all. Being fellow travelers who share complementary interests and goals, quite quickly we became friends, and we've kept in touch ever since. I clearly remember, when Brian first told me that his next project would involve documenting the work of James Bama, that I was both dismayed and delighted. I was dismayed because, being a life long fan of Bama's work, I was jealous as hell that I wasn't going to get to do the book on that worthy and his art. Still, I was delighted because I knew that there wasn't a better choice to do that book than Brian. And, having had a chance to pour over the final product, I can now say with real happiness that my original impulse was right--James Bama: American Realist is one of the best books published in the past year, and Brian was the perfect choice to do it. However, if truth be told, I'm still more than a little jealous. But I'll get over it. In the meantime, here's a revealing conversation with Brian about the story behind that triumphant book, and the long, hard road he had to travel to see it become reality. BB: Let's start with an obvious pair of questions: Who is James Bama, and what makes him such a good subject for a book? 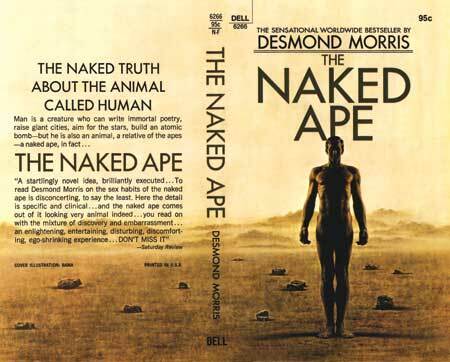 BMK: James Bama revolutionized the paperback book market in the 1960s with some of the most beautifully painted covers ever done. 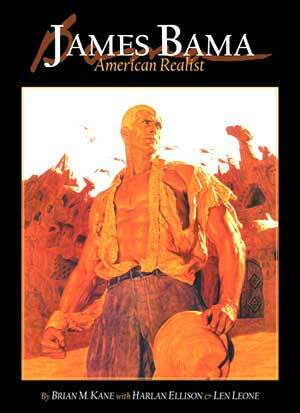 Most people recognize him as the artist who redefined the look of Doc Savage for Bantam Books. Bama painted 62 of the first 67 Doc Savages [Bantam reprinted] and influenced artists such as Boris Vallejo, Michael Whelan, Alex Ross, Dave Stevens, George Pratt, and many others. He painted the covers for Aurora's monster model kits at the height of the Monster Craze, and painted the first Star Trek promotional art. Bama also illustrated stories or covers for five Pulitzer Prize-winning authors. His art covered all genres and he is one of the most copied artists of the late twentieth century. BB: I know that there were a pair of book about Bama's work published a while back by someone else, which brings up the question: Does the world really need another book on Bama's work? After all, how much difference could there be between James Bama: American Realist and those other books, really? BMK: The Western Art of James Bama and The Art of James Bama dealt almost exclusively with Jimmy's Western art. James Bama: American Realist focuses primarily on his illustration career. The book contains selections of his Men's magazine art, Pop Culture book covers, Aurora monster boxes, and of course, Doc Savage. 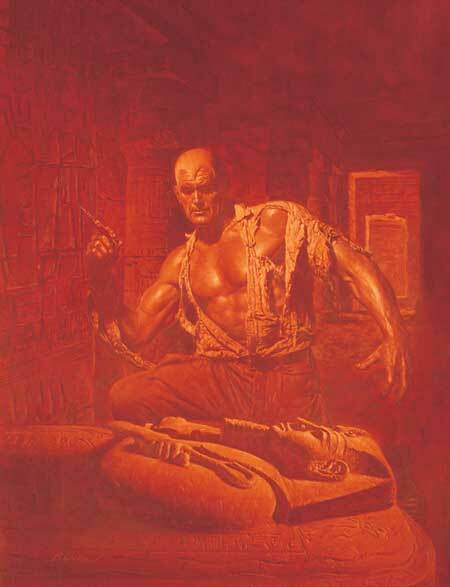 Every Doc Savage cover image Bama created is reproduced in one volume for the first time. There is also a chapter on Bama's Western Fine Art containing pieces that have never been printed before. BB: So when did you first come up with the initial idea for the book, how long did it take to develop into its current shape, and what major differences, if any, are there between the published version and your original vision of this project? BMK: I had the idea back in 2002. After Hal Foster: Prince of Illustrators was reviewed in the New York Times Book Review and was an Eisner Award nominee and IPPY Award winner, I figured I had some clout to get another book published. Bama was thrilled with the idea but finding a publisher proved to be a problem. A full color book is costly. Most large publishers aren't doing them anymore, and smaller publishers have limited resources, so it has to be an artist that has personal interest, personal meaning to the publisher in order for it to see print. The overall design didn't change from start to finish. Minor things changed, like when original art or transparencies from contributors were sent to me during the design process, but there were no major changes. BB: Was there much of a difference between that process and the one which resulted in your earlier book? 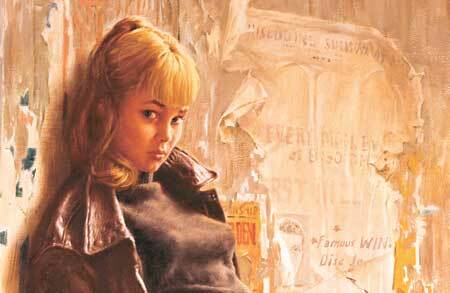 BMK: James Bama: American Realist is primarily an art book. There's biographical material in it but it's not a strict biography. Also, since it's full color I was able to take advantage of that and "play" with the design process even more. With Hal Foster the text came first and the images were laid in afterwards. With James Bama, and I know designers get freaked-out when I say this, I designed the book first and then wrote the text to fit. It's not as difficult as one might think because I was "writing" the basic text was in my head the whole time I was designing each page. Most writers tend to ramble; to overwrite, but this method forced me to be very succinct and be extremely frugal in choosing my words. It made me a better writer. There are anecdotes from my interviews with Jimmy throughout the book. It's structured so that we are walking through a gallery with Bama and he's telling us about his art. There are a lot of funny stories there. BB: I know that Bama is famously reluctant to discuss his work. Did you have much contact with Bama, and what kind of input, if any, did he have? 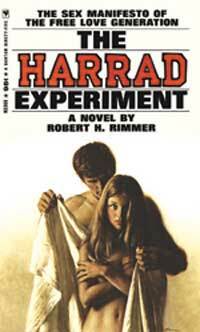 BMK: I got to know Jimmy when I was writing the Hal Foster biography. He's a huge fan of Alex Raymond and Foster, and he wrote the Introduction for my Foster book. We kept in touch after that and I approached him about the idea for a book on his illustration career in 2003. I went to Wyoming and spent a weekend with Jimmy and his wife, Lynne, just talking and going through his scrapbooks. Since the book started we've been phoning each other a couple times a week and I've been sending him sample pages on disk so he can see the progress. BB: How did the project end up with John Fleskes, and what makes him the perfect publisher for the book? BMK: I've known John since he published his Franklin Booth book. As it turns out we share a similar passion for illustration and for its preservation. John wanted to expand Flesk Publications and broaden his presence in the market with high quality books on major illustrators by other writers. Just like any other writer, when you're trying to elevate an art form, when you're trying to bring respect to your artist, you want to reach the greatest amount of people possible. I believe I can achieve that goal with John. BB: As is usual for a Flesk Publications book, the reproduction of the art is stunning, and each piece seems to be in pristine condition. Did you really take the time to assemble only mint copies of books, posters, etc., or is there more to the story than might appear at first glance? BMK: Unfortunately Jimmy only had a few transparencies of his original art; however we did get some additional transparencies from Walt and Roger Reed at Illustration House, and Bob Chapman from Graphitti. Most of the printed cover samples Jimmy had were pretty worn so Rodney Schroeter, who has been a Bama collector for years, supplied me with a huge amount of material. 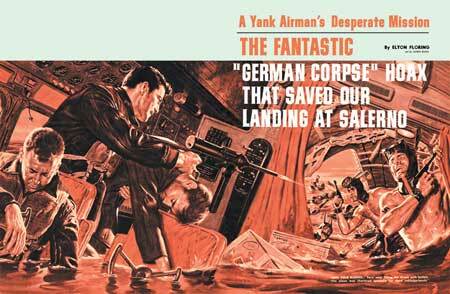 Except for one Pulp cover, every paperback cover was restored to pristine condition. All the chips, cracks, tears, and folds were digitally removed. All the titles, names, logos and miscellaneous lettering on the covers were recut onto their own layers to give them a crisp look. In some instances I spent more time on cleanup than it took Jimmy to paint the art. I spent over three years on the project, most of it on cleanup, but it was important to showcase Jimmy's art and give it the respect it deserves. BB: Do you think that is going to be your preferred approach to art reproduction in the future, or is it more likely that you'll make that decision on a subject-by-subject basis? BMK: No, it will never be a preferred approach for me! I say that quite emphatically. Perhaps if the project was underwritten by a University or through grant money from an Arts Council interested in digitally restoring and preserving illustration I might be interested. It's a huge investment of time and effort to do this kind of restoration work without any money coming in as I did. BB: What would you like readers to get from American Realist? BMK: I want people to rediscover Bama, to see why he's so respected by a whole generation of artists. I want young artists to be able to see Jimmy's art so they can understand why he's in The Society of Illustrators' Hall of Fame. Anyone who knows Bama's work also knows how influential - how inspiring his art is. I don't know why no one did it sooner. I'm just lucky I guess. BB: What do you hope to accomplish with this book in the long term? BMK: For a copy to be in every library in the United States. Public, private, college, high school--all of them. Pure illustration is fading because the traditional markets are vanishing. When was the last time you saw an illustration on the cover of Time or Newsweek? Time's Person of the Year was always a portrait - now it's a photo. In high school and college I lived off of library books. If a 16-year-old can take a copy of the James Bama book home from the library to study it and be inspired by it, then I've succeeded. BMK: I want to work towards preserving illustration and seeing illustrators getting the respect they deserve. I helped get Hal Foster inducted into The Society of Illustrators Hall of Fame, and that gave me a great sense of accomplishment. I love it when a new book on an illustrator comes out, or I get my copy of Illustration magazine (Unabashed plug: Everyone should be buying Dan Zimmer's Illustration magazine!!!) because it keeps this art form alive. My ultimate goal is to establish the first American Illustration Research Library connected to a major university. Thanks to technological advancements in digital scanning equipment, low-cost storage devices, relational knowledgebase management systems, and Web Design, we are now in an excellent position for aggressively preserving and utilizing this vast repository of Illustration. If we, as a society, do not put forth the effort to safeguard Illustration now, we will be throwing away a huge part of our cultural identity. BB: Now that you've finished this book, and you're a man of leisure, what's next? A vacation on the Riviera, perhaps, or do you have another book already in the works? BMK: I'm currently working on a charity book, The Revised Prince Valiant Companion, to help raise money for the "Friends of Hal Foster Society." Their goal is to build a life-sized bronze Prince Valiant statue in downtown Halifax, and proceeds from the book will be donated to that cause. It's an updated and revised version of the 1992 Manuscript Press edition. 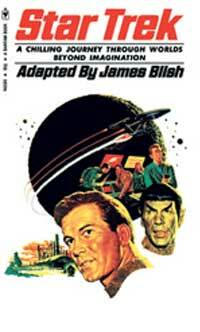 The original chronicled the stories up until February 24, 1980, and this edition will include the last 26+ years. Rick Norwood, Todd Goldberg, and Carl Horak's widow have given us their permission to reprint their original material. Arn Saba is allowing us to reprint his interview with Hal Foster, and we will be including my interview with John Cullen Murphy. I still need to conduct an interview with Gary Gianni and Mark Schultz who are currently chronicling the adventures of the noble Prince. Ray Bradbury has already written a really heart-felt Introduction and Cullen Murphy has agreed to edit the whole thing. My plans are to have it done within the next year. In addition to writing/designing books and doing freelance art I also teach at The Columbus College of Art & Design. I'm currently finishing my Master's Degree requirements in History of Art at The Ohio State University, and I'm planning on starting my Ph.D. in Art Education with a concentration on Visual Culture later this year. As you can see I keep myself pretty busy. BB: Given all that, why don't you tell the good folks reading this how they could contribute to the cause of keeping you in school, doing books and feeding your family? How can we order your books, and is there any other ways people could help out? BMK: Well, from www.fleskpublications.com of course, but they can check out all the usual haunts: Diamond, Bud Plant, Amazon, etc., as well as retail stores like Barnes & Noble, and Borders later this year. BMK: If anyone reading this supports the preservation of illustration and helping young artists, please tell your local libraries you want them to carry more books like James Bama: American Realist. There are a lot of good ones out there, so make a list and take it to your library today!